1. Pursuant to our dated 07.02.2019, Sri Ajay Kumar Bharti, Sri Ram Sumer, and Sri Ramesh Shankar Srivastava are present. Sri T. P. Singh, Senior Advocate assisted by Sri Siddharth Nandan, Advocate is presently representing aforesaid Officials. 2. 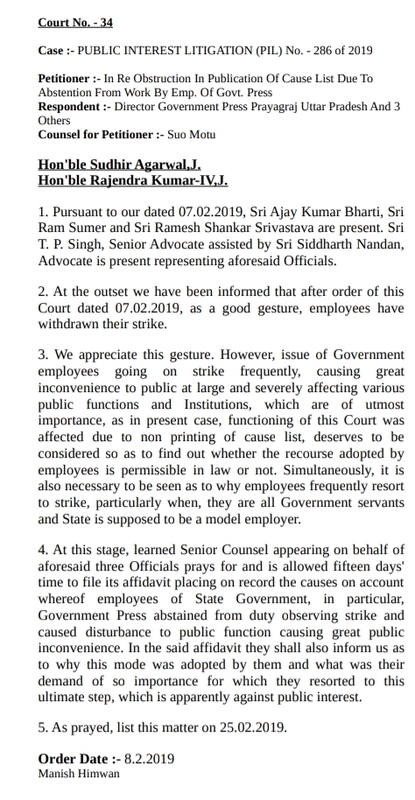 At the outset, we have been informed that after the order of this Court dated 07.02.2019, as a good gesture, employees have withdrawn their strike. 4. At this stage, learned Senior Counsel appearing on behalf of aforesaid three Officials prays for and is allowed fifteen days' time to file its affidavit placing on record the causes on account whereof employees of State Government, in particular, Government Press abstained from duty observing strike and caused disturbance to public function causing great public inconvenience. In the said affidavit they shall also inform us as to why this mode was adopted by them and what was their demand of so importance for which they resorted to this ultimate step, which is apparently against the public interest. 5. As prayed, list this matter on 25.02.2019.